FATE OF REBEL STATUES: Pressure is mounting on Maryland state leaders to remove a State House statue depicting one of the state’s foremost defenders of slavery, with a Democratic candidate for governor, the speaker of the Maryland House and a progressive group calling for its riddance Monday, Ovetta Wiggins and Josh Hicks of the Post report. Since Sunday afternoon, hundreds of people have signed an online petition from Our Maryland, a progressive political group that spurs movements on social media, asking Gov. 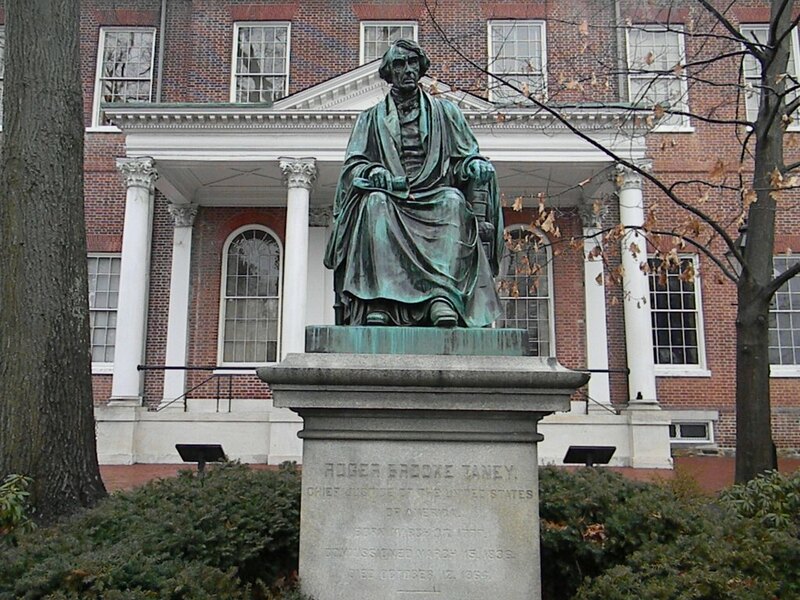 Larry Hogan (R) to take action to remove the Taney statue, Danielle Gaines of the Frederick News-Post reports. In the wake of a violent white supremacist rally in neighboring Virginia, House Speaker Michael E. Busch said Monday it’s time to take down Maryland’s most prominent Confederate-era monument. Luke Broadwater reports in the Sun that Baltimore Mayor Catherine Pugh pledged Monday to take down Confederate-era monuments in Baltimore — and said she has asked contractors for estimates on how much it will cost. “It’s my intention to move forward with the removal of the statues,” the mayor said. She said she planned to look into moving them outside the city, suggesting Confederate cemeteries as one possibility. Mark Reutter of Baltimore Brew reports that Pugh said she will follow the recommendations of a year-old task force on how to handle Confederate monuments in Baltimore by appointing a new task force that will “provide a public time line for removal of the monuments.” But one councilman is calling for their destruction, not removal. The Baltimore City Council and the mayor are in agreement the statues should go, but the final fate is undetermined, according to Nadia Singh of WMAR-TV. Someone poured red paint over a Confederate monument in Bolton Hill, defacing the 114-year-old statue during a weekend in which violence erupted at a white nationalist rally in Charlottesville, Va. Baltimore police had not received reports of the vandalism, a spokesman said Monday afternoon. Howard County Executive Allan Kittleman and the county council are discussing the possibility of removing a Confederate monument from outside the county’s Circuit Court building in Ellicott City, Kate Magill of the Howard County Times reports. Council chairman Jon Weinstein said that the monument is likely to be moved to the Howard County Historical Society Museum nearby. JEALOUS CHALLENGES HOGAN ON STATUE: Maryland Democratic gubernatorial candidate Benjamin Jealous said Monday that Republican President Donald Trump did not go far enough to condemn displays of white supremacy after violent clashes boiled over in Charlottesville. He also challenged Gov. Larry Hogan to remove a statue of a controversial Supreme Court justice in Annapolis, Andrew Metcalf reports in Bethesda Beat. HONORING REAL MARYLAND HEROES: Sun columnist Dan Rodricks offers some creative ideas about what to do with the city statues once they are torn down, such as melting them and turning them into coins honoring real Maryland heroes such as Frederick Douglass and Harriet Tubman, selling them and giving the procedes to the Thurgood Marshall College Fund. 8 RX POT GROWERS GET FINAL OK: Maryland’s medical marijuana regulators approved final licenses for eight growing companies on Monday, allowing them to start cultivating the drug. Erin Cox of the Sun reports that several companies said they are ready to begin growing immediately, while others say they will take weeks to get started. Until Monday, just one of the 15 selected firms had received final permission to start cultivating medical marijuana, which was first legalized in the state in 2013. Big cheers went up around the meeting room on Monday as Maryland medical marijuana regulators approved eight licenses for growing operations in the state, including two in Frederick County, reports Danielle Gaines in the Frederick News-Post. RX POT DEADLINE EXTENSION SOUGHT: Some of the nearly 20 companies seeking to grow or process medical cannabis in Maryland run the risk of having their licenses rescinded by a state commission, reports Bryan Sears of the Daily Record. Patrick Jameson, executive director of the Maryland Medical Cannabis Commission, urged members of the panel to consider extensions of the one-year deadline to receive final approval on a case-by-case basis. Some companies, he said, will have legitimate reasons for seeking an extension. HATE GROUPS IN MARYLAND: Hate crimes in Maryland are on the rise according to Maryland State Police. Already this year, several suspected hate crimes have been linked to a Maryland resident. While the Southern Poverty Law Center cites 18 hate groups in the State of Maryland, MSP lists a total of five, reports Joy Lepola for WBFF-TV. PLANK QUITS TRUMP PANEL: Under Armour founder Kevin Plank became the second CEO to resign from President Donald J. Trump’s advisory jobs panel on Monday after the president was widely criticized for not quickly denouncing groups that marched at a white nationalist rally in Charlottesville, Va., Jeff Barker reports in the Sun. Maryland state Sen. Michel Hough posted a tweet last night that was critical of Plank’s decision to leave Trump’s manufacturing council, saying it was “Another pelt on the wall for the Left. Shameful,” writes Ryan Miner for a Miner Detail blog. Although Hough quickly deleted the tweet, it was still noticed by former Attorney General Doug Gansler and Ryan Miner. U.S. Rep. Steny Hoyer also wasn’t satisfied with President Donald Trump’s statement Monday afternoon condemning the weekend violence, John McNamara writes in the Annapolis Capital. In Hoyer’s view, it took too long for Trump to call out by name the white supremacist groups involved. JOHNS ENTERS DELEGATE RACE: A 32-year-old Chevy Chase Democrat says she’s running for a District 18 seat in the House of Delegates because the state needs more women in elective office. Mila Johns said she’s lived in Maryland all her life, and watching Sen. Barbara Mikulski retire without a woman in the state’s congressional delegation was deeply upsetting, Doug Tallman writes in MyMCMedia. WHILE VACATIONING … Josh Kurtz of Maryland Matters goes over a short list of newsworthy items that occurred while he took a vacation out west, including John Delaney’s decision to run for president and David Trone’s decision to run for Delaney’s House seat. FRAZIER WITHDRAWS ORDINANCE: Taneytown Councilman Donald Frazier stood outside of City Hall on Monday evening to discuss censuring other council members following his wife’s failed lawsuit against the city, but ultimately withdrew the ordinance, Heather Mongilio of the Carroll County Times reports.